balance me Radiance Face Oil is a, 100% natural, moisturising facial oil which adds an extra layer of hydration to your skin routine, designed to restore the natural lustre and radiance to your skin, transforming dull and dehydrated skin and giving you a radiant, dewy and glowing complexion, plus creating a perfectly even tone by calming areas prone to redness. balance me Radiance Face Oil has a blend of skin-boosting and smoothing ingredients including ancient skin conditioners Yarrow and Benzoin, to help create a radiant complexion, conditioning and softening Buriti, Rosehip, Moringa and Camellia oils and soothing Roman Chamomile. Active Ingredients: Sweet Almond Oil, Grape Seed Oil, Kukui Seed Oil, Jojoba Seed Oil, Rosehip Oil, Yarrow Leaf Oil, Benzoin Resin. 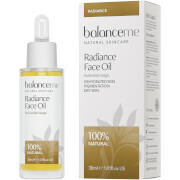 balanceme Radiance Face Oil 30ml was found on 3 websites and was price compared using EAN: 5060131094960. The cheapest balanceme Radiance Face Oil 30ml is shown as the main item, prices range from £25.20 to £30.00, excluding delivery. Price comparison based on price and delivery charges, with any valid discount codes being applied, is shown in the table above. Prices and information correct at the time of publication.